Gonzalo Higuain scored twice as Napoli easily beat Frosinone to move top of the Serie A table at the halfway stage of the season. Raul Albiol, Marek Hamsik and Manolo Gabbiadini also scored to take Napoli two points clear after 19 games. Higuain's goals took his tally for the season to 20 in all competitions. Napoli, who have not won the title since 1989-90, went top after previous leaders Inter Milan lost 1-0 at home to Sassuolo earlier in the day. Albiol's close-range goal following a corner gave Napoli the lead in the 20th minute and Argentina international Higuain doubled the lead 10 minutes later with a penalty. Hamsik, Higuain and substitute Gabbiadini all scored superb individual goals after half-time before Paolo Sammarco pulled one back nine minutes from time. Match ends, Frosinone 1, Napoli 5. 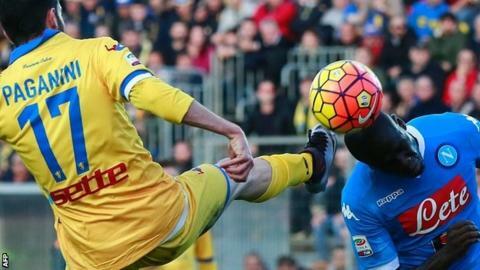 Second Half ends, Frosinone 1, Napoli 5. Foul by Nathaniel Chalobah (Napoli). Attempt missed. Manolo Gabbiadini (Napoli) left footed shot from outside the box misses to the left. Assisted by Omar El Kaddouri. Offside, Napoli. Jorginho tries a through ball, but Manolo Gabbiadini is caught offside. Corner, Napoli. Conceded by Modibo Diakité. Attempt blocked. Manolo Gabbiadini (Napoli) left footed shot from outside the box is blocked. Assisted by Omar El Kaddouri. Attempt blocked. Omar El Kaddouri (Napoli) right footed shot from the right side of the box is blocked. Assisted by Dries Mertens. Goal! Frosinone 1, Napoli 5. Paolo Sammarco (Frosinone) right footed shot from the centre of the box to the high centre of the goal. Assisted by Aleksandar Tonev. Attempt saved. Elseid Hysaj (Napoli) left footed shot from the right side of the box is saved in the bottom left corner. Assisted by Dries Mertens. Corner, Napoli. Conceded by Roberto Crivello. Attempt saved. Jorginho (Napoli) right footed shot from outside the box is saved in the top centre of the goal. Assisted by Ivan Strinic. Attempt missed. Dries Mertens (Napoli) right footed shot from the left side of the box is close, but misses to the left. Assisted by Manolo Gabbiadini. Attempt blocked. Daniel Ciofani (Frosinone) right footed shot from outside the box is blocked. Assisted by Raman Chibsah with a cross. Goal! Frosinone 0, Napoli 5. Manolo Gabbiadini (Napoli) left footed shot from outside the box to the top left corner. Assisted by José Callejón. Attempt saved. Danilo Soddimo (Frosinone) right footed shot from outside the box is saved in the bottom left corner. Assisted by Paolo Sammarco. Substitution, Frosinone. Danilo Soddimo replaces Federico Dionisi. Attempt saved. Dries Mertens (Napoli) right footed shot from the left side of the box is saved in the centre of the goal. Attempt blocked. Gonzalo Higuaín (Napoli) right footed shot from the centre of the box is blocked. Substitution, Frosinone. Raman Chibsah replaces Oliver Kragl. Attempt missed. Federico Dionisi (Frosinone) right footed shot from outside the box misses to the left. Goal! Frosinone 0, Napoli 4. Gonzalo Higuaín (Napoli) left footed shot from the centre of the box to the centre of the goal. Goal! Frosinone 0, Napoli 3. Marek Hamsik (Napoli) left footed shot from outside the box to the bottom left corner. Assisted by José Callejón. Foul by Robert Gucher (Frosinone). Substitution, Frosinone. Aleksandar Tonev replaces Luca Paganini.